HAWKEYE Gold & Diamond Inc. (the “Company” or “HAWKEYE): Vancouver, British Columbia: announces that it has released its first NI 43-101-compliant report for the company’s TOP Property which HAWKEYE owns an option to purchase a 100% interest in the Property and is located approximately 59 km west-northwest of Carmacks and 207 km northwest of Whitehorse, Yukon. The Property is situated in the Carmacks Caldera which is inferred to be a volcanic-related subsidence structure (collapsed volcano) that hosts significant northwest-trending geological structures and has important gold geochemical signatures and is thought to be the originating source of many of the Yukon’s mineralizing events in the Dawson Gold Belt. The Carmacks Caldera is an underexplored area and is considered to be a new and developing discovery area play in the Yukon. Rockhaven’s Klaza Property adjoins the TOP Property to the south where mineralization in excess of 1.0 gram gold equivalent/tonne over significant widths (3.04 to 36.50 m) were intersected by Rockhaven in 36 of 40 diamond drill holes completed in 2010 and 2011 with one hole intersecting 12.51 m averaging 5.03 g/t gold and 14 g/t silver. 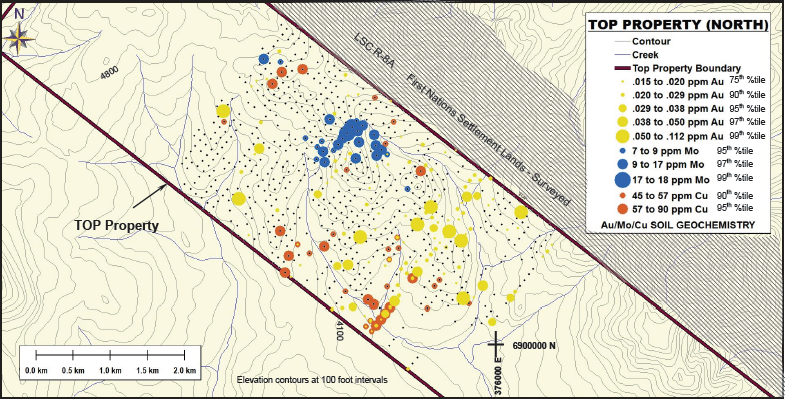 Northern Freegold’s Nucleus deposit which has a NI 43-101-compliant Indicated Mineral Resource estimated at 48.5 million tonnes grading 0.70 g/t gold, 0.90 g/t silver, and 0.06% copper, with a cut-off grade of 0.4 g/t is located approximately 12 km north-northeast from the TOP Property. The TOP Property is also situated 20 kilometers northwest of the past producing Mt. Nansen high grade gold-silver mine (556,500 tonnes grading 11.93 g/t gold and 211 g/t silver). 4) The TOP property has lithological and geophysical similarities to nearby gold deposits. 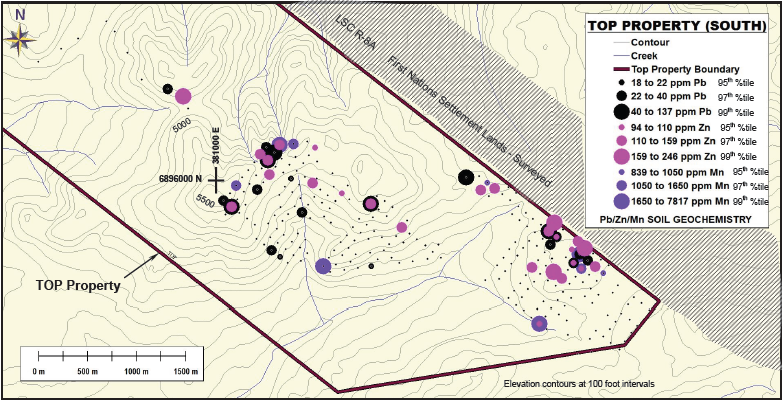 In June and July 2011, HAWKEYE carried out an exploration program that consisted of 1,034 geochemical soil samples, 25 geochemical rock samples, and approximately 12 km of prospecting and reconnaissance geological traverses. Work was concentrated in two areas designated TOP North and TOP South, covering approximately 20% of the Property. 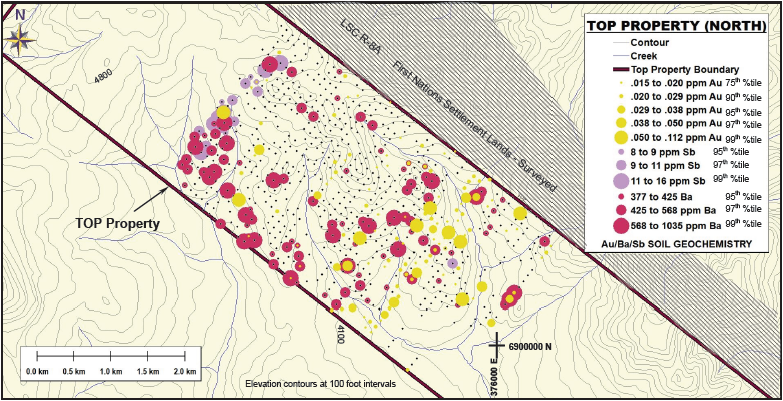 In the TOP North area, soil results show that anomalous gold values occur across the sampled area, but are concentrated in an arc located to the east, south, and west of the central plutonic granitic knoll. Gold and barium distribution appears to be closely associated. Copper values are low and widely scattered, but distribution is similar to gold and barium. Historically, gold values from soil sampling are considered significant when greater than .020 ppm. Gold values from soil sampling on the Property range from <0.005 up to 0.112 ppm, silver values ranged from <0.1 ppm to 0.5 ppm, copper values from 4 ppm to 80 ppm, molybdenum <1 to 18 ppm, Antimony from <2 ppm to 16 ppm, barium from 21 ppm to 1035 ppm, and arsenic from 5 ppm to 202 ppm. 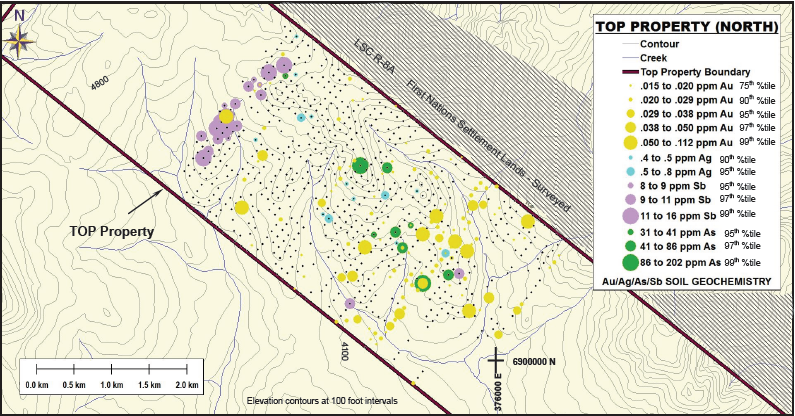 In the TOP South area, zinc, manganese, and lead values are scattered across the sampled area, but show clusters in the eastern and western portions of the sampled area. These three elements show a close positive association where high values of one element are closely associated with high values of the other elements. Soil samples analysis returned values of lead ranging from <2 ppm to 166 ppm, zinc from <2 ppm to 246 ppm, and manganese from <5 ppm to 7,817 ppm. The technical information in this news release has been reviewed and approved by Mr. Ed Harrington (P.Geo.) who is hereby identified as HAWKEYE’s “Qualified Person”, as defined by NI 43-101, for the TOP Property. The NI 43-101-compliant report for HAWKEYE’s TOP Property can be viewed at www.sedar.com or on our website at www.hawkeyegold.com. The Company is very encouraged by the results of its 2011 work program over the TOP Property and looks forward to advancing the Property to the drilling stage. Further news will be forthcoming with regards to the Company’s 2012 work program on its TOP Property.